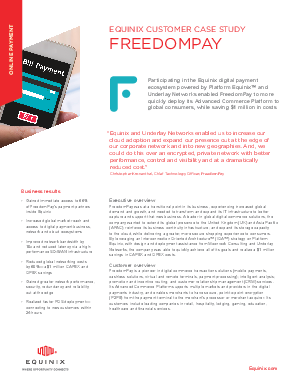 FreedomPay, a leader in global digital commerce solutions, wanted to expand its global presence in the United Kingdom and Asia Pacific while reinforcing business infrastructure, expanding storage to the cloud and providing a more security shopping experience. The company leveraged an Interconnection Oriented Architecture™ (IOA®) strategy on Platform Equinix along with other design and deployment partners to achieve its goals and realize $1 million saving in CAPEX and OPEX costs. To find out more, download this case study today.